This week I planned on posting a research interview with Ken Sanders, who was a star relief pitcher in the early days of the franchise. I’m going to shift direction due to the recent passing of Gus Gil and save the Sanders post for next year. Tomás Gustavo Gil Guillén was born in Caracas, Venezuela on April 19, 1939. While his major league career spanned just parts of four seasons as an infielder, he does have a place in Brewers history. So let’s take a look at his baseball career and time spent in Milwaukee. Gil’s road to the majors began in 1959 when he was drafted as an amateur free agent by the Cincinnati Reds. At that point only six Venezuelan born players had made it to the majors, starting with Alejandro Carrasqeul in 1939. 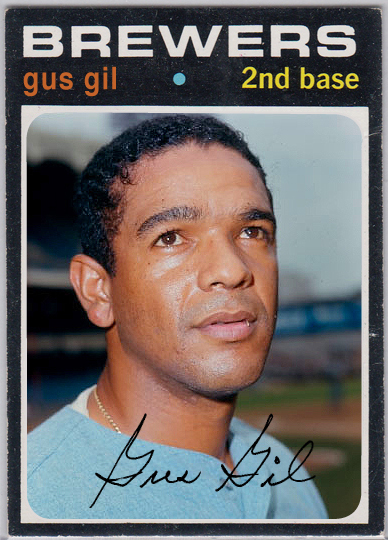 Gil would eventual become the 10th Venezuelan in baseball history when he made his debut for the Cleveland Indians on April 11, 1967. Drafting international players was still relatively new in the sport. By the time Gil played for the Brewers in 1970, only two other foreign born players were on the team – Sandy Valdespino from Cuba and Roberto Pena from the Dominican. Gil’s seven years in the minor leagues were spent as part of the Reds organization. In 1967 the Indians purchased his contract and brought him to the big leagues. He had already spent three full years at the Triple A level, and had proven how valuable he was defensively. In fact, his nickname “El Maestro” came from his defensive abilities. Gil was not known as a hitter, but it can be said that many players in that time period relied on their gloves to have a career. Pitching dominated the game during the 1960’s and batting averages plummeted. A high fielding percentage such as Gil’s fit in well with the emphasis on pitching and defense. Gil’s fielding percentage was eight points higher than the major league average during his playing career. He only committed 5 errors in 383 career chances, good for a .982 fielding percentage. After appearing in 51 games for the Indians in 1967, Gil spent 1968 in the minors. In 1969 he returned to the majors with the expansion Seattle Pilots. This turned out to be the year that Gil played the most, as he appeared in 92 games and logged 241 at bats. When the Pilots were bought in bankruptcy court in 1970 and moved to Milwaukee, Gil was part of the team, but started the year with Triple A Portland. As mentioned in previous posts, the early Brewers teams were in a constant state of change. Player moves were commonplace and as a result, Gil didn’t spend much time in Portland. On May 18, 1970, Gil joined the team as infielders John Kennedy and Greg Goossen were sent to Portland. In a 3-3 game against Cleveland, entered the game as a pinch-hitter and lined a single to left, giving the Brewers a walk off win. This was on Bat Day when the Brewers drew 44,387 fans – enough to bring down Bernie Brewer (Milt Mason) from his summer home on top of the County Stadium scoreboard. Gil again played for the Brewers in 1971, but only appeared in 14 games, and was sent back to the minors. His final major league appearance was in a pinch-hitting role against the Chicago White Sox on June 30. He continued to play in the minors until 1975 in Hawaii, and then spent 1976 in the Mexican league. He also played winter ball in the Venezuelan League throughout his career, from 1959-1977. Gil spent his off-seasons working as a draftsman. Gil also had a career as a manager after his playing days ended. Teams included the Aguilas del Zulia in the Venezuelan Winter League in 1979. He also managed the Danville Suns in 1982, and the Bluefield Orioles in 1990 and 1991. For his efforts, Gil was inducted into the Venezuelan Baseball Hall of Fame in 2008. Gil passed away in Phoenix on December 8, 2015 after battling various health issues.